Born on January 25 , 1972 in Jerusalem Israel. Dr. Boaz Schwartz came to the U.S in 1993 after serving three years in the Israeli military. He attended Towson University where he graduated with honors in Biology and Biochemistry. He then attended the Pennsylvania College Of Optometry and received an award for clinical excellence. 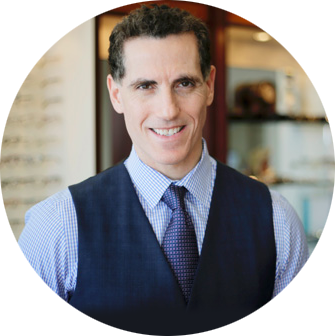 Dr. Schwartz believes that each patient needs individual attention, and always take his time with each patient’s eye exam.” I believe in getting to know my patients and spending time with each and every one of them, it creates a fun atmosphere and makes the exam process less stressful for them”. A fitness enthusiast and a competitive swimmer in the Maryland Master Swim program, he believes that a healthy mind lives in a healthy body! Dr. Schwartz advanced training in specialty contact lenses allows him to fit patients with keratoconus and other corneal diseases. He uses state of the art corneal mapping that allows him to customize and fit contact lenses for the most difficult and challenging cases. Dr. Schwartz lives in the town of Mt. Airy with his wife Nikole and their two children Ari and Daliah. We are proud of Dr. Schwartz achievements. Read more about their associations and awards.